Commercialising Political Experience: Can George Yeo Turn His International And Regional Relationship Into Commercial Assets? Former foreign minister George Yeo has been appointed senior adviser to Malaysian conglomerate Kuok Group as reported in the media. What actually does a senior adviser do? Can his advice add value to a private business enterprise? We don’t know yet and it is also too early to tell. However, he has at least proved that he has some market values even without a government job. Kuok Group may not pay him as well as the Singapore tax payers but anyway, he manages to find a job other than an offer from GLCs. In this, we have to respect him (so do Lim Hwee Hua) for stepping out the comfort zones. Lim is different from George as she was in the finance and investment sector before joining the government. George is first a military man and then turns into a politician and minister. His market value seems to be in his foreign relationship. From his facebook pages, you can see that he visited here and there and met up with foreign friends. He certainly has more experiences in international and regional development than his other PAP ministers, perhaps, even better than PM Lee. But having knowledge and experience is one thing, providing strategy and advice is another thing. You are some body when you are in power but another person when you are out of power. Therefore, acting like a philosopher and providing different possibilities without implementing the selected strategy may be best matched by George’s character and intelligence. For this, he has no executive power over his advisory and he does not need to report to shareholders of the Group. Business owners may or may not accept advices from their advisers. An adviser has less responsibility as compared to a minister. A minister has to shoulder the negative impact of his ministry’s policies, just like Wong Kan Seng and Mah Bao Tan. Both lost their ministerial jobs after GE2011. But will George be happy by just giving advices to private business group? Is this the best way out for a thinker like him? Singapore “Al Gore” – a possibility? - Member of the International Advisory Boards of Harvard Business School and IESE Business School. May be a few more. As a knowledge man, perhaps he can contribute things on East-West cultural exchanges and help to show off the soft power of Singapore. Singapore is well known for our economic success. So, why not do some things on the soft power? George has less financial worry as Singapore tax payers have paid him well enough through the pension scheme. He should consider contributing something on the arts, cultural and values to the world. Just like Al Gore, who lost the controversial President Election in the USA, but he keeps himself moving to another personal achievement in environment. I think George’s interest is not on business profit making and his best matched activity is some things like philosophy and thinking. Will we see a Singapore “Al Gore” in the making? Chen Show Mao's Tang Analogy Is Not Good Enough. It Must Go Beyond Wei Zheng And Forms The Government. Singaporeans should move forward and go beyond Tang Tai Zong and Wei Zheng in the Tang’s analogy. This is to enable the alternative party has a chance to be the government and runs Singapore according to their wishes. Chen Show Mao’s analogy is inline with the Workers’ Party’s analogy of driver and co-driver. A co-driver cannot always be the co-driver. Otherwise, he will be the trainee driver forever and becomes the “opposition’ permanently in Singapore. In his speech in parliament, Chen used the Chinese word <在野党> (alternative) rather than <反对党> (opposition) to describe the party sitting the opposite side of the ruling party. Alternative gives a hope of providing different views and opinions and if the voters accept them, the alternative views and opinions will the ruling of the next government. With this regards, we have to agree with the PM and 3 PAP MPs who voiced out their views after Chen’s speech and analogy. First, PM Lee said, "Being principled does not mean not being afraid to offend the government, because the government is not the Emperor and doesn't chop heads off!" Yes, totally agree, the PAP government is not the Emperor and in modern day Singapore no one will chop off your head. Even with the ISA, the government can only detain a person but not to chop off his head. Most importantly, there is no more Tang Tai Zong in Singapore. We are a Republic with an elected parliament. I wonder why PM Lee wants to use the words ‘chop heads off!’ Is he too angry about the Tang’s analogy that there is no more Emperor? We also have to agree with Sembawang GRC MP Ellen Lee who rejected Chen’s analogy, arguing that it was inappropriate to compare the PAP to Emperor Tai Zong as he was an autocratic ruler in a feudal era. speaking out or voicing out is not enough. The most important thing is the voters must ensure the democratic system works in Singapore and vote according to their wishes without fear and favour and give alternative party a chance. I also agree with another PAP MP Sam Tan. His analogy of the current state of Singapore politics seems more appropriate than Chen. He used “党外有党，民主思想” (multi-party and democratic thinking) while Chen used “党外无党，帝王思想” (one and no other party and emperor thinking). He also pointed the past mistake of communists that was not inclusive and not willing to accept different opinions#. Perhaps, he should move one step further to examine his own party whether similar mistakes occurred before. Again, like Sam Tan pointing out the past mistakes of Communists, he should also ask the PAP the same question. Water is like the people who can keep the current government but also can bring in a new alternative government. This is, in fact, the actual meaning of listening to the people. Yes, as Chen mentioned and pointed out that the government must listen but not be afraid of the people. It is no necessary to prevent and treat our people like a theft. (我们不必防民如防贼). When there are different views and opinions from the people, the government must listen intensively but not to form negatively conclusions. Anyway, all of us are the citizens of Singapore, why are you so afraid of the people? Indirectly, the PAP’s relevant analogy of the ISA existence is another way of treating citizens like thefts. Just for the record of the Chinese history, there were many ‘thefts’ that listened to the people and acted on their behalf. Some of them managed to overthrow the Emperors and begun their new dynasties. Should Low Thia Khiang accept or not accept Nanyang Alumni Achievement Award? Will there be a difference if he is not a politician? If he is not a politician, he is unlikely to accept the award. But again, if not because of his political achievement, Nanyang Technological University will not likely to give him the award. His business achievement will not likely to land him the achievement award. This is the political reality in Singapore. If Low rejects the award, the government and the media can easily classify him as a trouble maker or a non co-operative figure, some things like his former boss JBJ - opposing everything for the sake of oppositions even though it is not true. However, deep in his heart; and back to the reasons that he left his post of a Chinese teacher and his disagreement with the closure of Nantah, Low knows that some Chinese educated people will not like his comprising role - a role that against the belief of his principal. English educated politicians will not have this unfair and controversial treatment and funny position. This is especially for Low who stands as an opposition and in principle should voice out the wrong doings of the government in Chinese language. (Low did make his points clear for the Chinese language and he has tried his best). 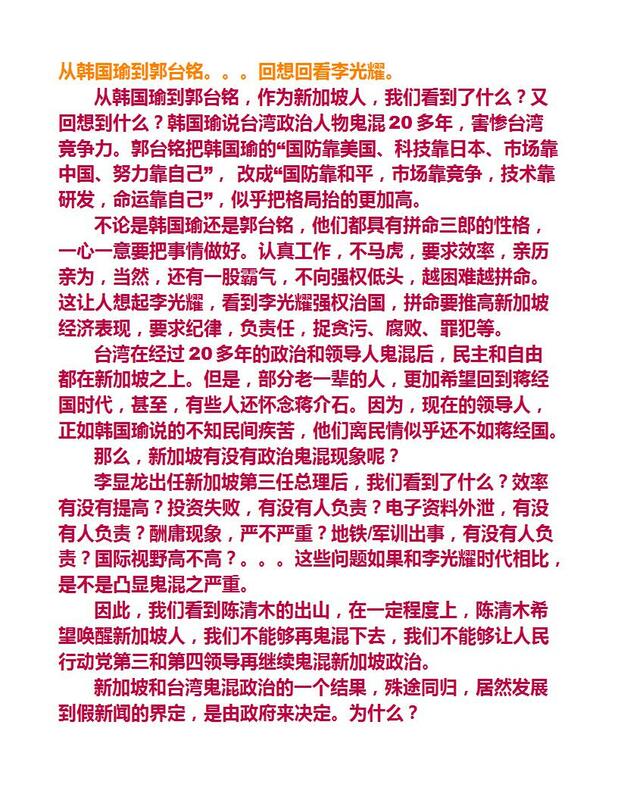 Many Chinese educated PAP MPs have been branded 汉奸 (betrayal) in the issue of Chinese language policy in Singapore. It is a strange thing in Singapore: people who know the Chinese language and have Chinese education have to face the dilemma and receive the blame of not defending the language. While people setting the changes in language policy sit in office at ease and look at the dog fight of Chinese educated Singaporeans. No wonder less people are wiling to learn the Chinese language – why create another burden on yourself as life is already not easy in Singapore. The compromising role that Low is adapting can be seen as a survival strategy. There are many Chinese stories that great achievements are only achieved after great humiliations, for example, 勾践复国，韩信. The survival strategy is also championed by Laozi. Laozi wants people to accept negative things but not to give up life. To break a GRC is a big achievement. To remain in Hougang SMC for nearly 20 years is a small achievement but a survival strategy. This tactic seems working for Workers’ Party. NTU is different from Nantah. To award a Nantah graduate with a NTU alumni achievement is a political decision rather than a pure achievement award. Since Low is also a NUS honours graduate, it is even more appropriate for NUS to award him the achievement award rather than NTU. Low and his generation of Chinese educated Singaporeans have to carry this unfair historical burden with them forever. This is the political cost of Chinese educated Singaporeans. It is not a 是不是 (yes or no) that English educated Singaporeans have nicknamed them. It is a victim of the so-called sacrifice under our economic development, cohesiveness and unity. This is a sad true story that many Singaporeans fail to see and appreciate the sacrifice of Chinese educated Singaporeans. For the first time since independence, an opposition Member of Parliament is nominated to sit on the Committee of Selection in the Parliament. To the PAP, is it a wise choice? Or just to show the public, the government is now more inclusive than before. No matter what are the reasons; it has created opportunity for the opposition Workers’ Party to see how the PAP MPs work and their performance in handling issues. There are 2 ministers, 2 ministers of state in the seven-member Committee. Chen is not an ordinary person as he has worked with the top Chinese officials and bankers and top bankers and security regulators in the West. He has the experience of meeting top talents in the world and so it gives him a golden opportunity to judge and assess the quality of PAP MPs. How our highest paid ministers and politicians in the world compared to the top brains in the world? When encounter problems and selection of MPs to other committees in the Parliament, how smart are the PAP MPs have reacted and behaved? Are they skilful enough and have they intelligently discharged their duties as assigned? We, of course, cannot expect Chen to release his assessment report publicly. However, by working in the same committee, he will be able to assess and evaluate the stupidity or intelligence of the PAP MPs. Will there be a big gap in their image and capability as compared to the main stream media has projected? In a Facebook post, Chen said, "I feel privileged to be nominated for appointment to the Committee of Selection and look forward to working with the Speaker and other members of the committee in the performance of its functions." I think the word ‘privilege’ has a double meaning that gives Chen the privilege to look at the working of PAP MPs. If this is true, then, why the PAP wants to expose itself for the opposition to observe and assess? Or they want to influence Chen to join them in the next election by giving him the privilege to join the committee. If so, it will be a miscalculation. Chen with his high dignity and commitment to opposition politics will certainly not be so easy to be brought over. What a big difference in a short period of few months, Chen Show Mao has transformed himself from a celebrity to a member of the powerful Committee of Selection, an elite club of the Parliament. My brother sends me this picture without giving the source. However, it is a normal sequence of life; some may not have all the five bottles in their life. Some unlucky ones have only one bottle and jump straight to the last bottle. For some religions, the third bottle is a sin. 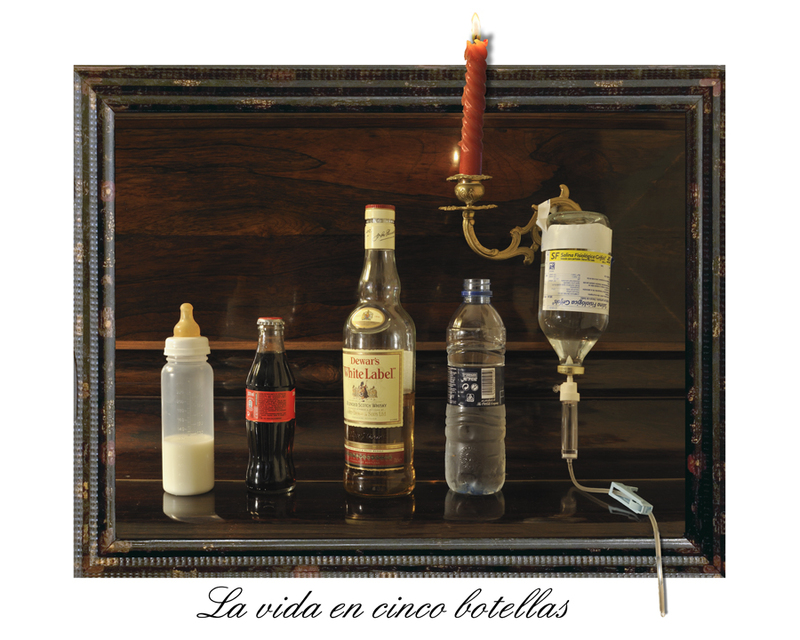 Anywhere, enjoy your life and complete your life with the first three or four bottles and avoid the fifth bottle. With the exception of people putting their first priority on the third bottle, in Singapore, the two most expensive bottles are the first one - bring up a child and a family; and the last one – medical care. This is why people are afraid to get marriage, to start a family and to have children. This has become our greatest challenge that we are not producing enough to replace ourselves. We fill the gap by importing bottles of soft drink, wines, liquor and expensive mineral water. We also welcome tourists to visit our hospitals to enjoy their bottles of medical care. However, in the contrary, Singaporeans are afraid to get sick. We would rather die than to be hospitalised. So, depending how you look at it, there are some visitors like the fifth bottle and enjoy their life here. So stay healthy be happy and leave the fifth bottle behind us. Have a happy bottling day! The long awaited Parliament has finally opened and everything is planned by the ruling PAP, including the election of the Speaker of the house, the seating arrangement and the President’s address for the next five years. However, the first thing the oppositions ask for is to have more time to speak to voice out for the people. The opposition Workers’ Party chief Low Thia Khiang has to urge the Speaker for more opportunities for opposition MPs to speak. Why is there a need or urge to request for more time and opportunity to speak if we have more opposition members of Parliament? So, don’t stop at six, in the next election, we should elect more opposition MPs to truly represent us in the Parliament, or even forming the alternative government. NCMP is a short term solution and we should make it irrelevant in the next election. In order to do that we need more people to come forward to represent and support the oppositions. Six opposition MPs is really a under representation for the oppositions. It is even not enough to form a shadow cabinet and so how to have a full debate on every issue. There is also a lack of resource support and think tank advisory. Hence, we may not have the opportunity to see high quality debate in other major democracies, perhaps, not even the standard of the Malaysia Parliament debates. Simply because it is a PAP “controlled’ parliament due mainly to the overwhelming number of PAP MPs in the Parliament. WP MPs will need some good strategies to break the monopoly and control. No only we need capable people to stand for the oppositions, we also need more voters to support the oppositions. 49.9% support will not win you a MP seat in the first past the post one to one election. If you want to have more alternative voices, do as the Aljunied and Hougang voters do, vote decisively in the next election! Hard Earned Cash Versus Digital Money, Any Difference? I was in Munich, Germany last year and was surprised to learn that some Germans still prefer cash over credit. There is a famous German restaurant serving typical Munich food that only accepts cash payment in this important industrial city. Before going to the restaurant, I was warned that I must have enough cash not credit to settle the bill. I wonder why? When everyone is talking about credit and liked to have credit over cash and what on earth, this particular restaurant only wants cash. And this is the first world country and it is one of the most advanced countries in the world. Electronic money and credit are not uncommon to them. It reminded me of the meaning of hard earned money. After a full day of hard work, it is really nice to see the takings of the day in cash, the physical money rather than credit in the bank. It makes a feel good feeling and it stimulates you to work harder the next day for more cash. It means you see the result in notes and coins, the real results of your hard work. However, there is no emotional value for credit, electronic or digital money, or virtual banking. You don’t feel it so much as these are numbers and sometimes you will take it for granted. Very often, you see traders in the big banks lost billion of money. These are figures to them, in a touch of button, they are gone or it may increase with a bigger number. You don’t feel pain when you lose the numbers. While when these are in cash and in billion of money and you really earn them through a hard way, before you place the button to transfer the money for a transaction, you will have emotional feeling. You feel the pain when this money is no more with you and it is a lost of many days of your hard work. These numbers are, of course, not the traders’ hard earned money. They just help to push the button on behalf of their clients and so they feel they have no responsibility to protect them. Or may be they forget they have the responsibility to protect them. When Temasek Holdings and GIC invest our hard earned CPF money, will they do it likes the traders or the German restaurant owner? Will they appreciate that their opportunity to invest in the world is given by CPF members? Technology is good and it makes work more efficient. However, it also creates more problems, especially, the lack of human touch. Because this electronic money is numbers, investment bankers, fund managers, and relationship managers all are engaged in the number game. They build the financial products and portfolios on different numbers, adding numbers on top of the numbers. At the end of the day, they lose their way in the number game and missed their way out. The numbers are like colours, music, flavours, and hunting that make a person loses his senses.